Sr Catherine Holum, who represented the US in the Winter Olympics of 1998, gave a talk at a Mass in Tuam to mark the closure of the Year for Consecrated Life. A former Olympic speed skater who is now a nun addressed the congregation in Tuam Cathedral on Sunday at a Mass to mark the closure of the Year for Consecrated Life. Sr Catherine Holum, a Franciscan Sister of the Renewal, is a native of Minnesota and now ministers in Leeds in the UK. She represented the US in the Winter Olympics of 1998 at the age of 17 in speed skating. 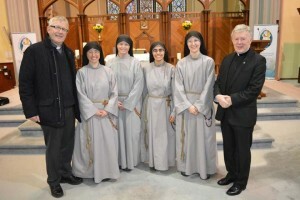 She travelled to Tuam with three other Franciscan Sisters of the Renewal who are based in Drogheda for the ceremony and spoke the assembled religious and laity about her vocation to religious life. In his homily, Archbishop Michael Neary acknowledged that the history of religious life in Ireland has had its ups and downs over the years. Stating that religious life has always been a counter-cultural lifestyle, Dr Neary said this is more in evidence today than in previous generations. “The idea that God has designated a person for a particular function or vocation strikes a discordant note in many modern ears,” the Archbishop told the congregation. He added that there is a tendency in our culture today to view life-long commitments with suspicion, yet this is precisely the nature of the commitment to which God calls people in religious life. Telling the religious and consecrated that holiness of life is the essential business of religious he said it ought to be the leaven in the Church as well as in society. He also emphasised that undoubtedly, there are both men and women who are waiting to hear the invitation “come and see”. In his Pontificate, Pope Francis urges religious to keep the longing for God alive in our world and reawaken it in the hearts of people, Archbishop Neary highlighted. “Pope Francis encourages us to look to the past with gratitude, to look to the present with passion and to embrace the future with hope, a hope that is not based on statistics but rather on the one in whom we have put our trust, the one for whom ‘nothing is impossible’,” he said.